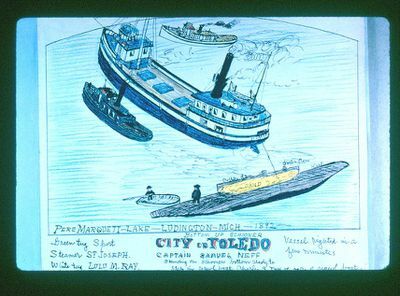 Scene at Pere Marquette Lake, Ludington, Mich.,1892: The green tug, Sport, the white tug, Lulu M.Ray, and the steamer St. Joseph, engaged in righting the wreck of the City of Toledo, floating bottom up, Capt. Sam Neff in charge. Capt. Neff, who later was granted a government patent on raising wrecks, had an inventive turn of mind. He placed sand against the keel of the over-turned vessel. At the proper moment he jumped into the yawl with his son Charles, ready at the oars; he gave the signal to the tugs and to the St.Joseph, which started pulling. The City of Toledo rolled with the weight of the sand, and the pull of the lines, and righted herself in a few minutes. Both the City of Toledo and the St. Joseph are listed in Beers, History of the Great Lakes, Vol. 1; Ship Masters' Assoc. Directory,1903;Inland Lloyds Vessel Register, 1893. The City of Toledo was purchased in 1892 by Neff & Sons, sold 1897.